There are different stories about who Khajeh Rabi was. Some sources introduce him as one of Prophet Mohammad's companions. Other sources introduce him as Imam Reza's slave or secretary or companion. The story goes that he accompanies Imam Reza to Tus for his visit/meeting with the governor of the region. When Imam Reza fell ill (perhaps poisioned) and later died and buried in the area where it is now called Mashhad, Khajeh Rabi decided to settle down - perhapd enjoy his new found freedom. In any case, he dies and is buried 6 kilometer northwest of Mashhad. 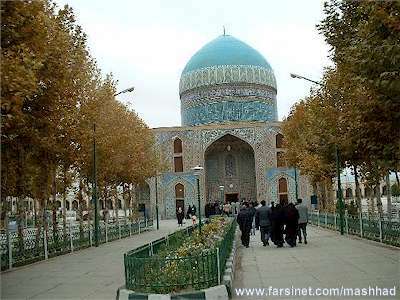 His mausoleum is one of the tourist attractions in Mashhad. At the end of a long alley of plane-trees, an elegant octogonal building with four porches overlooked by a large cupola decorated with some inscriptions by the renowned Safavid calligrapher Reza Abbasi. Khajeh Rabi Mausoleum and the surronding gardens are a tourist attraction, as well as one of the major cemetries for the residents of Mashhad and the surrounding towns and villages.